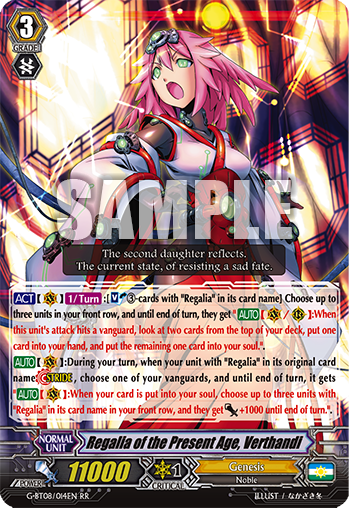 Today’s “Card of the Day” features the second daughter of Mior–…I mean Regalia. [ACT](VC)[1/Turn]:[Soul-Blast 2-cards with “Regalia” in its card name] Choose up to three units in your front row, and until end of turn, they get “[AUTO](VC/RC):When this unit’s attack hits a vanguard, look at two cards from the top of your deck, put one card into your hand, and put the remaining one card into your soul.”. [AUTO](VC):During your turn, when your unit with “Regalia” in its original card name [Stride], choose one of your vanguards, and until end of turn, it gets “[AUTO](VC):When your card is put into your soul, choose up to three units with “Regalia” in its card name in your front row, and they get [Power]+1000 until end of turn.”.